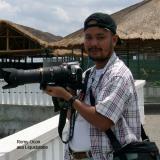 My name is Romy Ocon (aka Liquidstone in various internet websites), a native Filipino, a self-taught color-blind nature photographer, and the founder/administrator of the Philippine Bird Photography Forum. I was born and raised in a rural village in La Union (Northern Luzon, Philippines) where I learned to appreciate nature early in life. A product of the Philippine public school system, I’m a civil engineer by training and concrete technologist by specialization. I started my working career as an employed professional, then became an entrepreneur over a decade ago. In 2004, I semi-retired at 39 to concentrate on my passionate pursuit - wild bird imaging. There are about 612 species of Philippine birds, and 194 of these are endemic to our islands. Over 10% of these species are globally threatened. By photographing these magnificent winged creatures in their natural habitat and sharing the pics through the web, we hope that in our own little way we can help raise awareness for the protection of their habitat. We wish that the children of our children will still be able to behold their beauty long after our generation is gone. Selected photos from these galleries, complete with shooting detail, also appear in my BirdBlog. 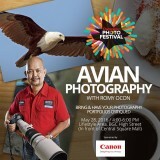 Note: Romy Ocon is honored to join the roster of Brand Ambassadors of Canon Philippines since March 2010. Canon 5D MIII + EF 70 - 200 f/2.8 L IS II, 200 mm, f/4, ISO 320, 1/125 sec, manual exposure in available light, hand held, near full frame resized to 1575 x 1050 pixels. SELFIE AT BUED RIVER. My tiny 455B tripod + 410 gear head, easily stowable on the rear rack of my iron horse, allowed me to take this selfie along Bued River. I pre-focused on the bike, tripped the 10-second self-timer, then rushed to mount the saddle before the shutter opened. manual exposure in available light, tripod/gear head, AWB, near full frame resized to 1500 x 1000 pixels. SELFIE WITH AN UWA. My cluttered desk becomes my studio for an experimental selfie session to check how this zoom renders the out-of-focus busy background. I laid down the camera on the desk with the wide open 16-35 f4 IS, focused on the model payloader via live view (near MFD), then tripped the shutter using the self-timer. manual exposure in available light, live view AF, self-timer, AWB, uncropped full frame resized to 1500 x 1000 pixels. SURFING IS MORE FUN AT SAN JUAN. This shutter-clicker enjoys capturing wave-riders with a 1D MIV + 500 f4 IS + 1.4x TC at San Juan Beach, La Union, Northern Philippines. A couple of 24" x 36" prints from the pre-production 7D Mark II were displayed during a photo-workshop I conducted at Baguio City on October 26th. As I expected, the prints turned out nicely as far as IQ is concerned, even when examined up close. Shooting info - CAP Cultural Center, Baguio City, October 26, 2014, 7D + 10 mm, f/4, 1/50 sec, ISO 1600, on-board flash at -2/3 FEC, hand held. which is among the early events featured in this year's Sillag Fest. SCOUTING LON-OY SPRINGS. I visited this weekend the foothills of the Cordilleras at San Gabriel town, near Lon-oy springs, to check out new birding places. manual exposure, camera on timer and atop a backpack on the ground, uncropped full frame. BIRDING BIKE. I just got a Honda XR125L for birding along nearby mountain trails where my 4WD can't go. My preferred combo for trail birding is a 7D + 400 5.6L stored in a small backpack. the bike sips gas very economically - about 55 - 60 km per liter in highway driving, and slight less on mountain trails. Handling is great too, even up and down steep dirt roads. manual exposure, camera atop a backpack on the ground, uncropped full frame. BIRDING FAR NORTH LUZON. Pogito and I stop to enjoy the view at the old Quirino Bridge over the Abra River at Santa, Ilocos Sur. We just came from a scouting trip at the northern tip of Luzon (Sta. Praxedes, Cagayan). TREKKING ALONG BUED RIVER. My friend Bebot's 4x4 pickup made trekking along the Bued river bed (Rosario, La Union) a breeze. CANON BRAND AMBASSADORS. Some 15 photographers specializing in various genres are featured in this print ad of Canon Philippines that appeared at The Philippine Star, July 28, 2010. CANON EOS 7D DIGITAL SLR HANDBOOK. Published by Reader's Digest Asia Pte. Ltd. and Canon Inc. (ISBN 978-962-258-389-4), this guidebook features the work of selected Asian photographers. In addition to Lester Ledesma's 7D samples, photos by two other Filipino shutter-clickers are included - John Chua (aerial, industrial and advertising) on pages 120 - 123, and Romy Ocon (wild birds) on pages 124-127. Philippine Hawk-Eagle (Spizaetus philippensis, a Philippine endemic, immature) captured at Subic rainforest with a hand held 20D + 500 f4 IS + Canon 1.4x TC. Little Pied Flycatcher and a Philippine Serpent-Eagle (all species and sub-species endemic to the Philippines). Shooting gear and information are available at the clickable links. BIF SHOOTING AT CANDABA WETLANDS. Yours truly (the one with a featherless head) shoots a beta 7D + 800 f/5.6 IS at birds in flight, as Ely T. (a friend and fellow birdshooter who owns the 800 5.6L) looks on. PBPF TEAM. On arrival, we survey the wetlands to check BIF activity. With weeks of continuous rains, only the road is above water in this part of Candaba. I'm holding the beta 7D + a 400 5.6 L (in black lens cover). With me (L - R) are Ralf N., Rey S.A. and Dr. Mando S.
STRIPE-HEADED RHABDORNIS. This photo of the Rhabdornis mystacalis. MY HD VIDEO RIG VISITS SUBIC RAINFOREST. I snap a shot of my bird filming rig during a lull in birding at Subic rainforest. Manfrotto 475B tripod + 3421 gimbal head, and Sandisk Extreme III 16 GB (30 Mbps) CF cards. BIRDING WAGON AT CANDABA WETLANDS. My birding vehicle is parked under a tree by the access trail, all around are rice plants near fruiting stage - perfect background for low-flying waterbirds. LOWLIGHT BIF SHOOTER. My 1DM2 + naked 500 f4 IS, supported by a Manfrotto 475B tripod and 3421 gimbal head, stands over the wetlands at sunset. It had fired its last BIF shot for the day, as light was already too low for BIFs even with high ISOs and an aperture of f/4. as bird shooter Nilo Arribas looks on and Lydia Robledo shoots some pics in the background. SIGMONSTER HABITAT - Here's one of the places where the Sigmonster shoots wild birds in Zambales, Philippines. A grassy area in a mini-plateau up the mountains of Masinloc is a goldmine for grass birds, coucals and kingfishers. The sweet early morning sunlight is captured well by the 300D + Sigma 10-20. ENJOYING FRESHLY-MANUFACTURED OXYGEN. We went up the Balsahan trail (Puerto Princesa, Palawan, Philippines) until we came upon a forked stream (after 4 or 5 stream crossings) . We stopped here to catch our breath and enjoy the view. I set up my gear and waited for more lifers, as my birding buddy Arnold took a snap shot. and it yielded a bounty of four lifers - Black-headed Bulbul, White-vented Shama, Grey-cheeked Bulbul and Olive-winged Bulbul. SIGMONSTER AT MT. MAKILING. The first Guaiabero nest (in darkened circle) is about 15 meters high above the ground, built in the fork of a tree trunk which is near a slope. Here, I position my 350D + Sigmonster on the slope for a better shooting angle, and my camera's elevation is about halfway between the base of the tree and the nest. The shooting distance is roughly 20 meters. Checking my compass, I note that the entrance hole of the nest is facing east. BIRDING LIGHTLY. The 20D + Sigmonster serves as my sniper combo, while the 1DM2 + battle-scarred 400 5.6L was my CQB SMG, as I set up atop Mt. Samat, Bataan in early 2006. Those were the days when birding was much "lighter". Now, the 400 5.6L is replaced by the much-heavier 500 f4 L IS + Canon 1.4x TC as my default medium-range shooter. A RACER AND A BIRDER. My brother Jeff (left) ably piloted our birding vehicle, as he made the over 500 km trip to Malasi Lake in just under 10 hours, including wading through heavy traffic along the way. Here, Jeff and birding buddy Neon pose by our car while we cross the mighty Cagayan river aboard a makeshift raft. LITTLEST RORO VESSEL IN THE WORLD? Supported by two wooden boats each with its own 4-cylinder diesel engine, the platform of the raft can carry 3 small cars or tricycles. I initially hesitated to risk the crossing, but when I looked at the faces of drivers that crossed before us, it looked like doing so is the most ordinary thing in the world. Well, the prospect of bagging quite a few lifers swayed me to go for it. SHINY-HEADED BIRDSHOOTER. While crossing the Cagayan river, I chat with our hosts Aloy (right) and Glen (left), both of Conservation International. EXCITED RAFT PASSENGER. Neon strikes another pose aboard the rickety raft as it docks at the other bank of the Cagayan River. WHEW.... WE MADE IT ACROSS THE RIVER. Jeff (and I) heave a sigh of relief as our vehicle makes it across the Cagayan River, and he was just too happy to drive to terra firma. I couldn't imagine the nightmare of the raft capsizing and God forbid, losing my Sigmonster, 500 f4 IS and other gear stowed in the vehicle. THE AMAZING MALASI LAKE. With the skies virtually cloudless, Malasi Lake bakes under the early afternoon sun. HEAVY ARTILLERY. The 350D + Sigmonster + Canon 2x TC struggles to bring the distant ducks closer.... even 1600 mm was not enough firepower to make the birds full frame. HIGHLAND BIRDING. I'm waiting for montane birds at elevation 2155 meters (Bauko, Mountain Province) when my brother Jeff snapped this pic. My "light" birding combo is the 20D + 500 f4 L IS + Canon 1.4x TC, mounted on a Manfrotto 3421 gimbal head and 475B tripod. is the highest point (Elev. 2256 m/7400 feet) of the Philippine Highway System. This is where I stop and calibrate my altimeter. BALD-HEADED SHUTTER-CLICKER (Birdus lunaticus): This specimen enjoys the view of the "8th Wonder of the World," as the fog rolls in over the Banaue Rice Terraces. It took some effort for me to smile for the camera, what with all the man-made mess around me. I'm actually lucky, I only come here once in a while to shoot birds, and this is NOT the place where I and my family live, wade, fly and feed. I'm cradling the 1DM2 + 400 5.6L (for fliers), while the 20D + Sigmonster is mounted low for better angle at waders. I was shooting Blue-throated Bee-eaters by the roadside at Subic, while fellow bird photographer Nilo Arribas was also shooting the shooter candidly. Candaba wetlands: The 300D + Sigma 300-800 DG is my fixed heavy artillery, while the 20D + 400 5.6L is always ready to shoot fliers. Batman and Robin (Nilo Arribas and me) pose for posterity with the verdant Maraag valley (Cebu) in the background. Raul Puentespina (our host), yours truly and our guide enjoy the view at Maraag valley, Cebu. I aim at a "tamsi" (Cebuano for sunbirds/flowerpeckers) at Maraag, Sudlon II, Cebu Province, a few minutes drive from Tabunan. Mutt and Jeff.... er... yours truly and Nilo taking a breather in Raul's unfinished goat shed, which we used as shelter. This color-blind clicker traverses a sheer-faced mountainside at Cebu's Tabunan mountains in search of the elusive Cebu Flowerpecker. SHOES NOT RECOMMENDED AT OLANGO ISLAND. If you really want to get close and personal with the Olango birds, sandals are a must. Better yet, you can wade in your bare feet for that ticklish feeling that the sand makes with your soles. Just avoid the sharp corals and broken shells, of course. OLANGO ISLAND: Bird hide no. 1 affords a good view of one of the tidal flats. The elevated walkway is no longer there, probably a victim of government funding red tape. OLANGO ISLAND: I have to use a tripod when I snapped on the Sigma 2x TC to my 400 5.6L while shooting the Little Egret that appears in the Olango Island gallery. This was in my early bird-shooting days, before I learned that a lower shooting angle is preferred for water birds. OLANGO ISLAND: The tropical Cebu sun provided good light for handholding the 20D + 400 5.6L, a few times even with the 2x teleconverter. Ekimzulad, a fellow DPR member from the US, had fun shooting the Subic rainforest birds with his 20D and 400 5.6L. RARE SPECIES AT MT. MAKILING. There are not many wild bird photographers in the Philippines. The 4x4 truck of Maxikrete Philippines, Inc. (my company) serves as a mobile shooting platform for birds along the trail. Nilo Arribas fires away at a SPOTTED WOOD-KINGFISHER, while I look for a better angle, halfway up the slopes of Mt. Makiling. I shoot a BLACK-NAPED MONARCH at the Mud Springs (Mt. Makiling) while Nilo Arribas waits for his turn. Photo by Jeff Carig, using a Sony FD 95. ISLAND COVE RESORT: I was trying out my then new Bigma at some captive Philippine Macaque monkeys in this resort at Cavite province. while my 20D + 400 5.6L hangs ready in case some flying raptors come into view. Wow. I was awe-inspired by your photographs! May I ask though if you have captured endemic birds from Masbate? Im planning to use it for our exhibit sa community sa Masbate to raise awareness initially. thanks sir! You follow your dream behind your camera, good for you. Your work is really remarkable. Keep up that track and many thanks for sharing your passion through your great images !!! Yesterday, January 7, 2011, while having breakfast in Ramon J. Quisumbing's mountain house in Mt. Banahao (Bangkong Kahoy, Dolores, Quezon), a bird smashed into the glass pane of a window, but killed itself when its sharp & hard beak pierced its chest. I took photos of the bird (looks like a Zamboanga Bulbul based on my bird book), but I would prefer experts to confirm the bird's ID. Would someone be kind enough to send me an e-mail where I can send the photos of the dead bird? Thank you, and happy birdwatching to us all!...Tito Poch. Great photos!! Keep up the good work! Romy, i read Ramon J. Quisumbing's invitation to you to join us in our bird watching in El Nido, Palawan, next year (March or April/09). Hope we see you on board his yacht next year (or earlier, I hope). We love your photos. I had e-mailed you for permission to download your photos in our laptops for identification purposes only. Your permission was granted. Thank you for this. Great photos of birds. Awesome captured historical wild life narratives specifically for Philippine birds. A great collection of birds images that might not be seen by future generations. I have not seen though pictures of some birds from Panay island, Philippines. Woodpickers, grassland dwellers, mountain and small island birds. You might want to visit Antique Province as well. nice pictures. even nicer advocacy. keep on taking pictures for the environment. Romy, thanks for very interesting pics and comments. Good luck and Best Regards, Jindrich. I got interested into bird watching and photography when I moved to the US about 5 years ago. You have amazing bird photos! I did not realize we have so many species of birds in the Philippines! I will make sure to look out for them on my next trip back. really enjoy your site, the shots, the humor in some of your comments plus the work you do on dpreview... no wonder you are semi-retired you spend so much time getting great photos and sharing them and your wisdom. Anyway enough of the back patting...get back to doing what you do best! Saw a link here while surfing dpreview for information on the new Canon 40D. Great images and site here!!! hilo kaya im jovito from olango island gosto ko pang e promote ang isla. for the beter island. A excellent and meritorious job. Thank you for sharing it. I'm a great fan yours since I discovered your work in BirdForum's Web. Your galleries are AMAZING to say the least! Thank you for dedicating the time and effort needed to share parts of a world most of us will never see. Your equipment is amazing. I dont understand how you can afford that stuff. Anyways, your photos are amazing. You truly refresh the desire to take pictures. I know I cannot produce anything like you! But i can feel the burn to get out there and try! Hi, very good your description about the SIGMA 300-800 300-800mm F5,6 EX DG APO. Many regards from Bonn ( Germany ).i wish you a good 2007, always good light , a quite hand and a good look. Great pictures! Must have been difficult! I'm very impressed. Some of your pictures are world-class. I hope you can contribute to the protection of the environment in the Philipines and other areas in South-East Asia. Great photo shots of birds in the Philippines. Truly world class pinoy talent. Keep up the incredible work you do. HELLO, SIGMA 300 800 MMM IS EXELENT LENSES. Do you ever consider to write a book about bird shooting? I will happy buy a book from a master like you..
i was browsing the net for some articles about my hometown bacnotan. i happen to see the article about you. your shots are great. i love them. great job, liquidstone! i hope all our kababayans in bacnotan would see how one of her sons have succeeded in the field of photography. by the way, do you happen to know my brother, arne 'sandy' marquez? regards & keep it up. very nice, i like the "behind the scenes" shots very much. that sigmonster is HUGE!!! as a begining birder myself i enjoyed seeing your setup & equipment. very lovely and interesting, thanks for sharing. Good I ddea to share that moments. Thanks for the view into how you get your very excellent photos.